For over 70 years, Faber & Kell's has been the definitive reference text in its field. 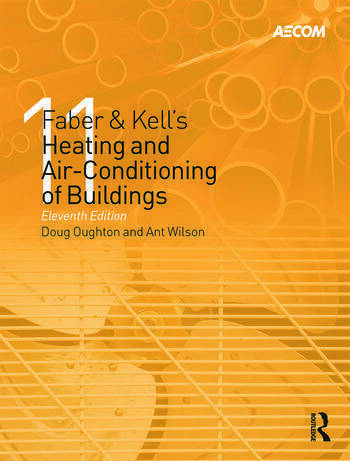 It provides an understanding of the principles of heating and air-conditioning of buildings in a concise manner, illustrating practical information with simple, easy-to-use diagrams, now in full-colour. This new-look 11th edition has been re-organised for ease of use and includes fully updated chapters on sustainability and renewable energy sources, as well as information on the new Building Regulations Parts F and L. As well as extensive updates to regulations and codes, it now includes an introduction that explains the role of the building services engineer in the construction process. Its coverage of design calculations, advice on using the latest technologies, building management systems, operation and maintenance makes this an essential reference for all building services professionals. Doug Oughton, after serving an apprenticeship with a national contractor, joined AECOM in 1967, became a Partner in 1981, a Director in 1983 and, after retirement, a Consultant in 2004. Doug was awarded AECOM Fellowship in 2011. He was awarded an MSc(Arch) by the University of Bristol in 1979 after presentation of a research paper dealing with energy consumption and energy targets for air-conditioned office buildings. He was CIBSE President for the year 2002/03. Doug is a Fellow of the Royal Academy of Engineering, a Chartered Engineer and an Honorary Fellow of the Chartered Institution of Building Services Engineers. Ant Wilson joined AECOM as a graduate engineer in 1979 following four years at Bath University and was awarded an honours degree in Building Environmental Engineering. He worked within the computer division and the applied research groups, was made a Director in 1990 and an AECOM Fellow in 2011. He now has responsibility for the company’s Sustainable Development Group within the Building Division. Ant is a Chartered Engineer, a Fellow of the Energy Institute, a Fellow of the Chartered Institution of Building Services Engineers, a Fellow of the Society of Façade Engineering and a Member of the Society of Light and Lighting.